Give me ICEE, Slurpee, Squishee. I am a fan of frosty blended drinks. I know they’re sugar laden and full of empty calories, but they’re an occasional treat that bring back happy summer childhood memories. When I couldn’t convince my parents to take me to get said frosty drink, I learned to experiment with ingredients we had at home. Capri Sun packets, juice boxes, iced teas, Tang, Kool-Aid. You name it. I tried to freeze it. Filipino households have a ton of parties and gatherings. We always had soda in the garage for the taking. I was making all sorts of concoctions during summer break. I don’t drink much soda nowadays. I probably average 6 cans of soda a year. 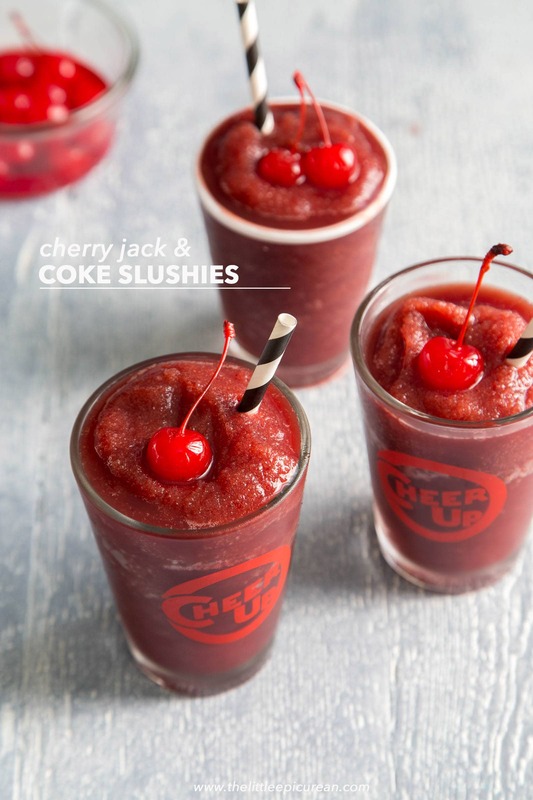 And all that soda consumption comes in the form of cherry Jack and Coke slushies. This recipe requires a tiny bit of prep. 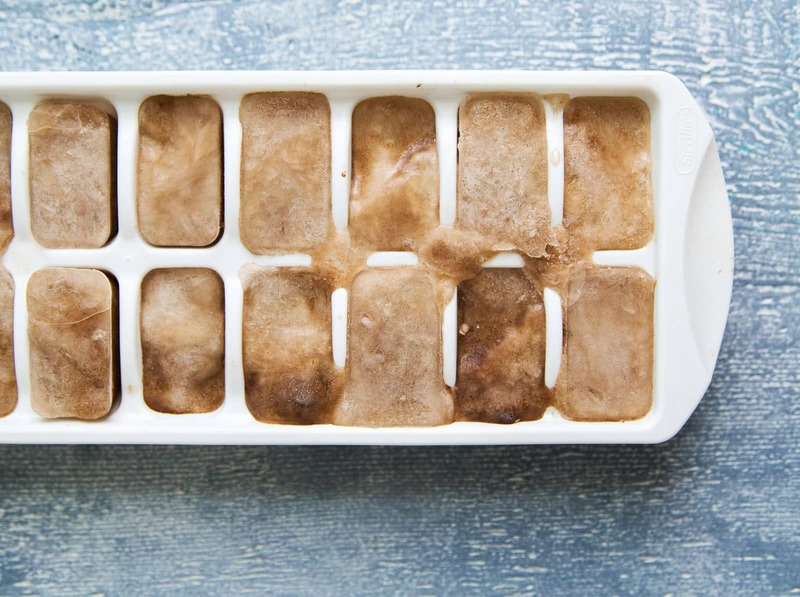 You’ll have to make Coke ice cubes ahead of time. After that it’s smooth sailing. 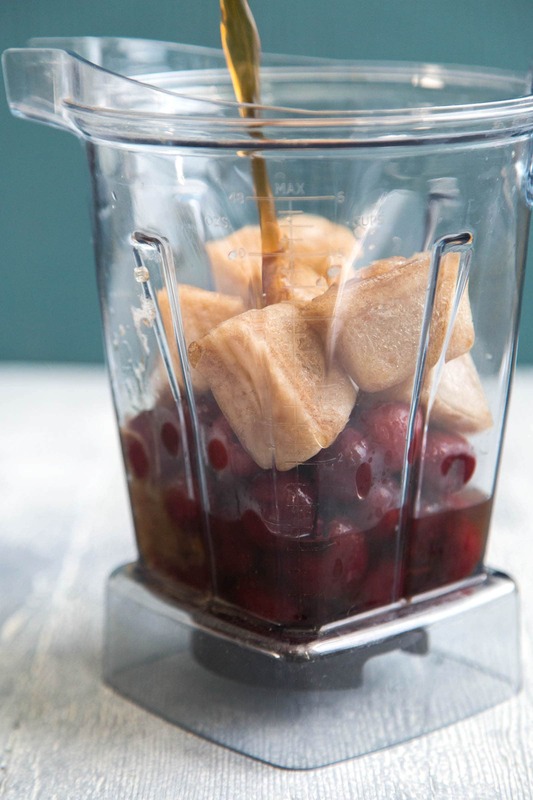 In a blender, combine frozen dark sweet cherries, Coke ice cubes, whiskey, and chilled Diet Coke. Let the blender do it’s magic and voila! Homemade slushie! 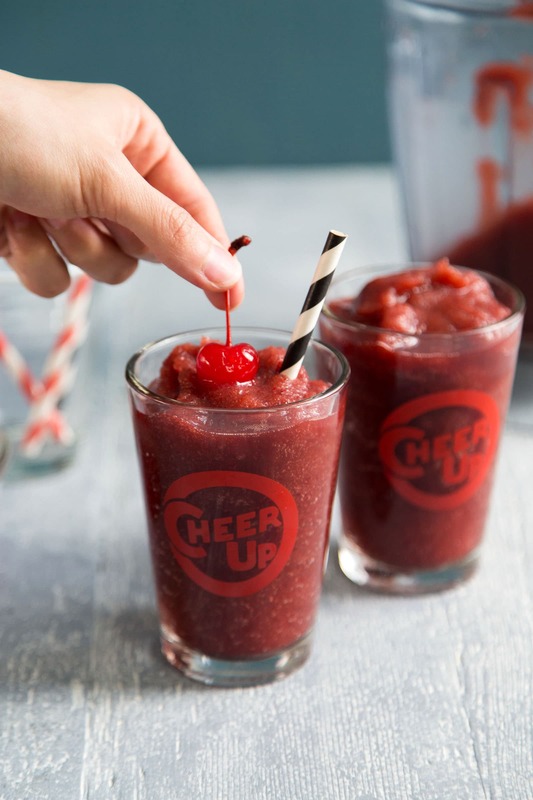 The resulting cherry Jack and Coke slushie will be thick, sweet, and refreshing. If you don’t plan on enjoying it right away, you can pour it into a freezer zip lock bag. Store it in the freezer for few hours until you’re ready to party. It will stay slushie in the freezer. However, if you freeze it overnight, it will solidify a bit. You can process it in the blender back to the desired texture and consistency. Jack and coke with a maraschino cherry was my signature drink in college and my early 20’s. It was easy to drink and available at pretty much any bar/party/kickback. I prefer this jack and coke slushie version a thousand times more. It’s a delicious and refreshing way to enjoy the last days of summer. P.S. If you’re wondering about the “Cheer Up” glasses, I bought them from Fishs Eddy. 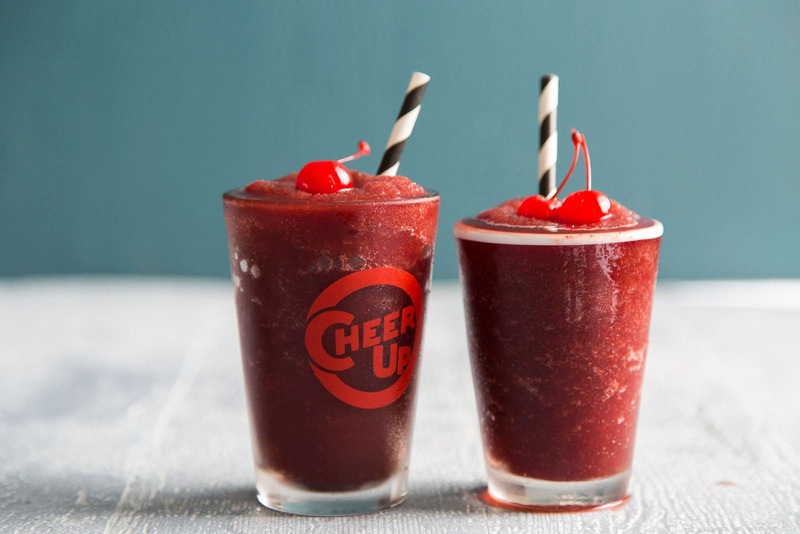 In a blender combine, Coke ice cubes, frozen cherries, whiskey, and chilled Coke. Process until smooth. 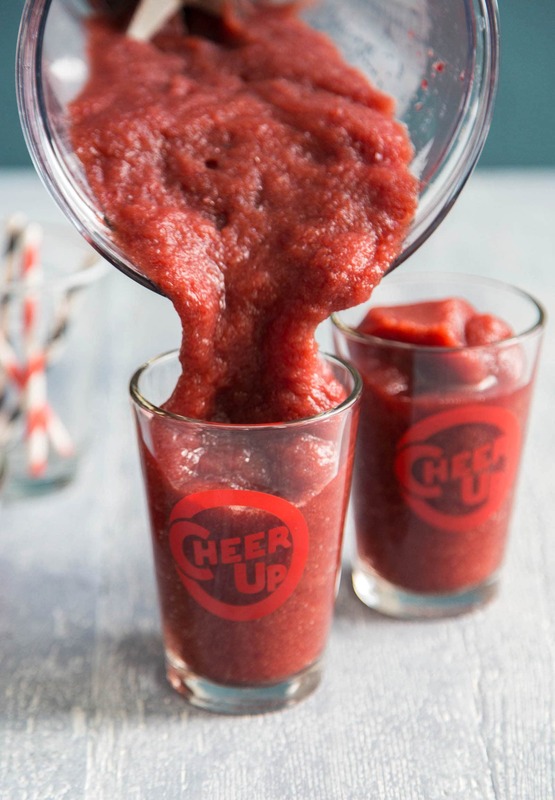 Serve immediately and garnish with maraschino cherry. Alternatively, transfer mixture to a freezer safe container (zip-lock bags work great). Keep in the freezer for a few hours until ready to serve. If left frozen overnight, the slushie will harden. Allow to sit at room temperature for a 5-10 minutes. Process in blender until desired texture/consistency is achieved. This looks so frosty & refreshing! :) Though I might have to sub rum for the whiskey. I am not much of a whiskey gal, lol. These look so refreshing! I love how creative they are. Holy smokes this looks soooo good! What a fun idea – I love it! I can imagine this would be super refreshing to kick back with for a summer party or on the weekend. Love it! These are a great way for everyone to end the summer with! This sounds like the most perfect drink! I wish I was drinking one right now!